Set offered as a complete package only. 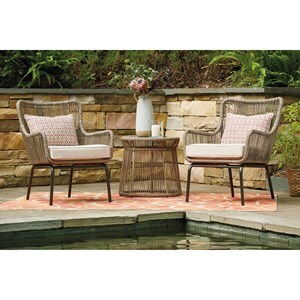 This four-piece conversation set will transform your outdoor space into a luxurious place for relaxation and gathering around with family and friends. With a sofa, two lounge chairs, and a cocktail table included in this set, everything your backyard needs is in one place. Constructed with rust-proof aluminum frames and with cushions covered in high-performance Nuvella fabric, these pieces are made to be enjoyed in all types of weather. 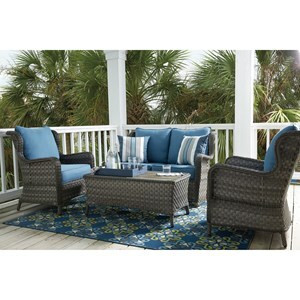 Sofa Dimensions: 76" x 30" 30"
Cocktail Table Dimensions: 44" x 25" x 17"
Lounge Chair Dimensions: 32" x 30" x 30"
The Meadowtown 4 Piece Outdoor Conversation Set by Signature Design by Ashley at Godby Home Furnishings in the Noblesville, Carmel, Avon, Indianapolis, Indiana area. Product availability may vary. Contact us for the most current availability on this product. Fabric Options High performance Nuvella fabric is easy-to-clean and stain resistant. Pillows Two throw pillows included with sofa.